1. Preheat oven to 375°. In medium bowl, whisk together flour, baking powder, baking soda and salt. In separate medium bowl, whisk egg lightly; stir in milk, honey, butter and vanilla extract. 2. In small bowl, combine cereal and yogurt; let stand 3 minutes. Stir yogurt mixture into egg mixture. Add flour mixture and stir just until combined (batter will be lumpy). 3. Line 12 standard muffin cups with liners. Spoon batter into cups and sprinkle with walnuts. 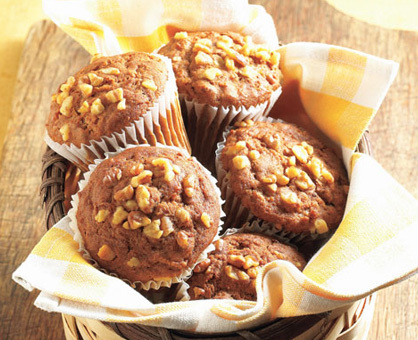 Bake 18 to 20 minutes or until tops are lightly browned and toothpick inserted in center of muffins comes out clean. Cool muffins in pan 5 minutes. Remove muffins from cups to wire rack. Cool 10 minutes and serve warm.